HomeOur BlogCherry Knolls Neighborhood Garage Sale Coming in May! Back for its ninth year, the 2017 Cherry Knolls Neighborhood Garage Sale is scheduled for Friday and Saturday, May 5 and 6. This event is organized and sponsored by The Steller Group of Keller Williams Realty, comprised of Realtor neighbors Conrad and Jennifer Steller, Emily Jones Lonborg, Bill Dehmlow and Blair Bryant. Last year, more than 80 households participated. The event has grown both in participation and its success, to the point that garage sale pros now look forward to it every year. Participation is free; all marketing expenses are underwritten by The Steller Group. Advertising will be placed in The Denver Post, The Centennial Citizen and online outlets, and professionally printed directional signs will be put out the weekend of the sale. During the sale, buyers will be able to strategically navigate the neighborhood with the use of maps that designate which homes are participating. Please be sure to sign up if you intend to have a sale. The more Cherry Knolls homes we publicize as participating, the greater shopper attendance we will achieve! Sellers registered with the garage sale will also have an opportunity to send out a “wish list” to other participants so that they can shop early, avoiding the need to leave their sale unmanned during the event. For those who don’t sell out and prefer not to keep their “leftovers,” a charity pick-up promptly follows the event on Saturday and is also coordinated by The Steller Group on behalf of participants. Last year, more than 60 homes donated their unsold items, making a positive contribution through their own decluttering. Even if you are not participating in the garage sale, please feel free to take advantage of the charity pick-up. 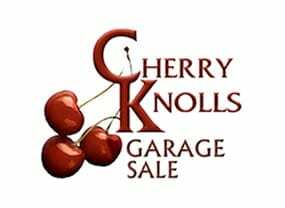 Click here to register for FREE as a garage sale location on the Cherry Knolls map and/or participate in the charity pick-up.